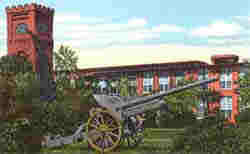 Krupp cannon in Gonzales, Texas, a WWI German artillery. This is a pretty rare item. A captured German field piece from WWI. Now parked in front of the National Guard Armory, it's hard to read any information from its painted surface. The name KRUPP stands out, but that was to be expected. Still in business, The Krupp Family took the advice of "beating swords into plowshares" and switched from guns to their present line of coffee makers. The cement pad it rests on has the date of August 5, 1917. Company "L" 141st Infantry is also inscribed. We were able to find a photo of Co. L, but no information on the gun. The names of a Captain and a 1st and 2nd Lieutenant are there as well, and one presumes they were the Commanders of "L" Company. We'll see what we can find out when we visit the Gonzales Library. Update: After following several leads, we were told that Mr. John DuBose of DuBose Insurance Co. is the son of 2nd Lieutenant Whit DuBose who was instrumental in bringing it here, although there is no word of its capture. His knowledge of the gun was limited as well, but at least he knows who owns it, although they are probably unaware they do. ATTENTION!, American Legion, you own the gun! We were determined to find out something more, since we figured that with a cannon featuring so strongly in their history, the soldiers of Gonzales would be more likely than other units to bring back an impressive souvenir. We were directed to Doug Kubicek, historian extraordinaire and who with the late Dr. Pat Wagner, were the ones to determine (not a small undertaking, to be sure) the authenticity of the "Come and Take It" Cannon. This led me to Hallettsville where Mr. Kubicek teaches Texas History. Like many a mystery in history, sometimes the trail just ends. Doug's guess is that it was chosen by Lieutenant Dubose from the arsenal of captured German ordnance. Incidentally, Hallettsville contributed their prize from WWI (a mortar which sat on the Courthouse lawn) to the scrap drives of WWII.